Well, this won't take long. August was all set to be a pretty interesting month with a DJing tour of China on the cards. Sadly, a few days before departure came the news that it had been cancelled, due to a combination of swine flu and the Asian typhoons. This left me with a highly routine and drudge-laden month. The only high point involved the airing of my mix on Radio 1's '1Xtra Mixtape' show overnight on Saturday 15th. The show is Mista Jam's, but on this occasion was being looked after by DJ Target. As is the case with 1Xtra's overall sound, the mix flits from Dancehall, to Bassline and UK Funky. The download link to listen again, alongside the full track listing, is right here. 'Just Buggin' continued to restore my faith in music every Wednesday. If ever I feel I've sold my soul to the devil with some of the disgraceful garbage I'm forced to play in clubs, my musical demons are exorcised the following Wednesday. Each session is proof that there's still great new underground music being made. You just have to invest a little effort in hunting it down as it's never right there on the surface. My two hours on-air are always the high point of my week. 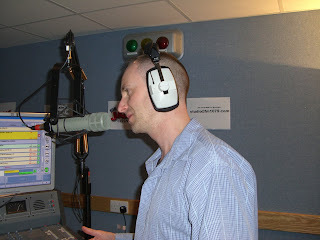 Abingdon MC Gillespie made another live studio appearance on Wednesday 26th, dropping more incisive freestyle lyrics. You can listen again to that one right here. ... and that was August. With a death in the family over the Bank Holiday weekend, this is not a month that I'll be looking back on with any fond nostalgia in my older years.